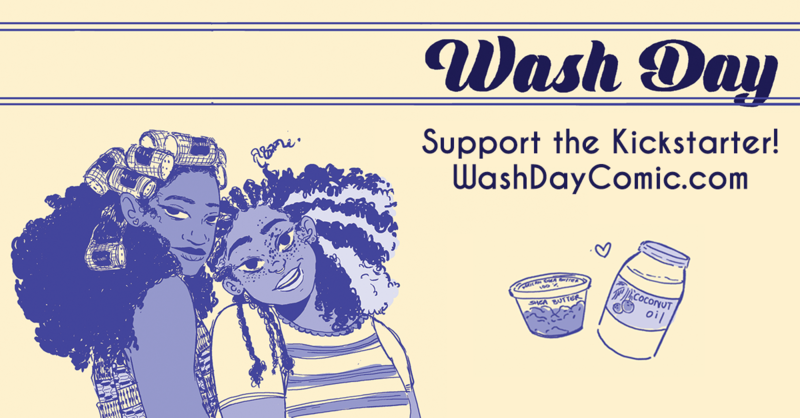 This week we are excited to share Wash Day, an upcoming slice-of-life comic from writer Jamila Rowser, one of the co-founders of Geek Girl Brunch, Straight Outta Gotham, and more. The Kickstarter for this comic was fully funded in less than 48 hours (WOW!) but you have until May 4th to back it and get a copy! This week we had a chance to chat with Jamila about the comic, what she’s working on now, and of course her current geek loves. First, congrats on getting your Kickstarter funded so quickly! This is your debut comic, which is super exciting. What inspired you to specifically write a comic instead of a short story or other medium? Thank you! I wanted to become a comic creator so I didn’t consider any other medium for Wash Day. I also believe the sequential art is the best way to tell the story of Wash Day. Allowing the reader to see, instead of imagine, Kim’s wash day routine. The concept art for this comic is gorgeous. How did you come to collaborate with Robyn Smith for this project? I first came across Robyn’s art because someone retweeted her work. I was looking for an artist to work on Wash Day that embodied the aesthetic that I wanted for the comic. Which was strong black and white art, can draw Black hair very well and had a great way of illustrating the subtleties in small moments. I found all that and more in Robyn. She’s such a kind and talented artist, it’s been a dream to work with her. What has been your favorite part about the creation process thus far? Seeing my script translated into the comic art. I worked on the Wash Day script off and on for almost 2 years, so to see Robyn translate my script into beautiful artwork has been a fulfilling and emotional experience. Do you plan to write more comics in the future? Any classic characters you want to write? Yes! I’m actually working on another mini comic that I hope to debut at the end of the summer. I won’t say too much yet, but it is sci-fi slice-of-life. As you know, here at Geek Girl Pen Pals we match people based on their top 5 geek loves. What are the top 5 things you are currently geeking out about? My Hero Academia is my everything right now and I’m probably too emotionally connected to the characters. I read the manga and watch the anime. My faves are All Might, Midoriya and Koji Koda. I started watching Hunter x Hunter a few months ago and love it! Gon and Killua’s friendship is so precious. I watched and read Land of the Lustrous recently and really enjoyed it. The first season ended in a way I never expected. The art in the manga is very different than what I expected from the show art. Overall, Land of the Lustrous is full of the unexpected in a really lovely way. Steven Universe is very near and dear to my heart. Other than Steven, Peridot has grown on me a lot. She makes me crack up! After all these years I’m still fangirling over Pokemon. I play PokemonGo and love that it encourages me to explore the beautiful parks in my neighborhood… and catch Pokemon! Thanks so much to Jamila for taking time to chat with us this week! 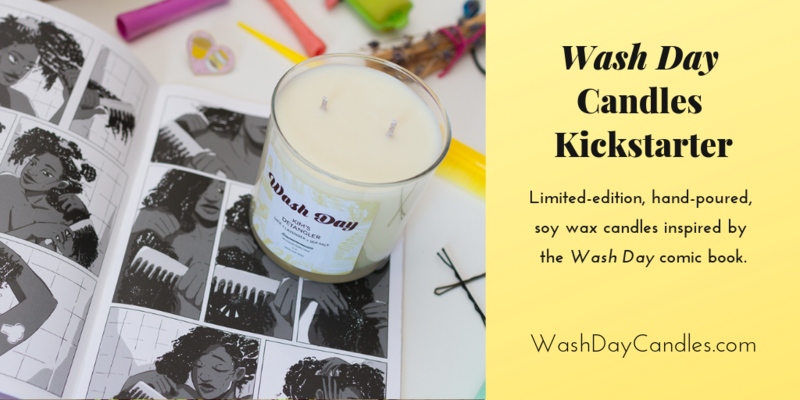 Be sure to visit www.washdaycomic.com to back this comic! 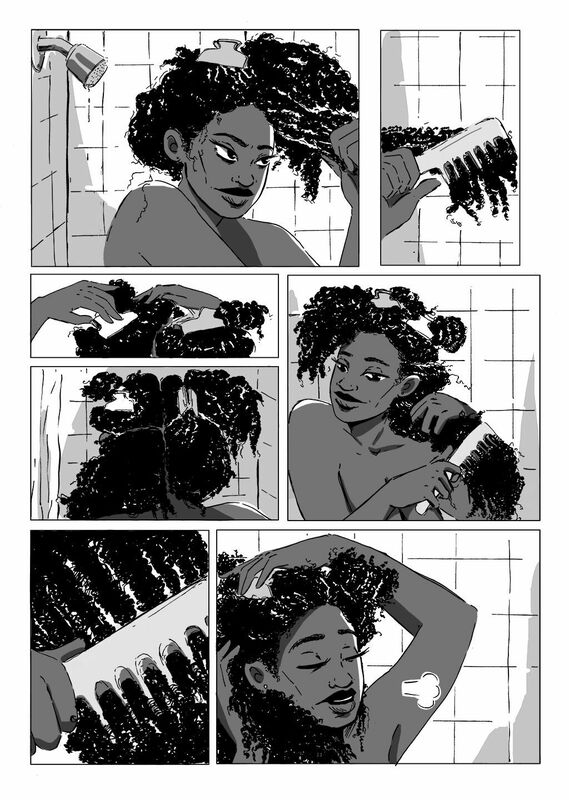 Wash Day is a slice-of-life comic that pays tribute to the beauty and endurance of Black women and their hair. The 27-page story was written by Jamila Rowser and illustrated by Robyn Smith, with script edits by J.A. Micheline. It follows Kimana, a 26-year-old woman living in the Bronx, as she cares for her long, thick hair. As Kim goes through her Sunday morning rituals, readers experience the highs and lows of her day—fresh coffee, rising rent, girl talk and catcalls. Jamila Rowser is a Black and Latina writer who has written for NYLON Magazine, MTV, Mass Appeal and Critical Chips 2 (which was nominated for the 2018 Angouleme Alternative Comics Award). She’s also known for co-founding the international meetup group Geek Girl Brunch, creating the hip hop x geek culture project Straight Outta Gotham and her former blog Girl Gone Geek. Robyn Smith is a Jamaican cartoonist, currently based in rural Vermont. She has a MFA from the Center for Cartoon Studies and has worked on comics for College Humor, The Nib and more. She’s also been featured on The Comics Journal list of The Best Short Form Comics of 2016 by Rob Clough and also Pen America by Whit Taylor, for her mini comic The Saddest Angriest Black Girl in Town. J. A. Micheline, or JAM, is a writer, critic, and editor. Her still-in-progress novel, Super Charismatic Nucleus, was shortlisted for Cambridge University’s Lucy Cavendish Fiction Prize in 2016 and her critical work has been featured in The Guardian, VICE.com, The A.V. Club and elsewhere.